Who uses NASA Earth science data? 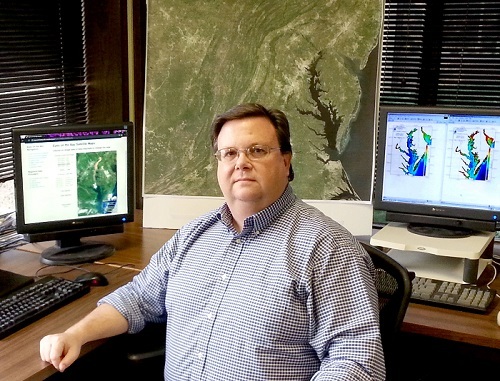 Mark Trice, to monitor the health of Chesapeake Bay. Mark Trice in his Maryland DNR office. The body of water on the map behind his left shoulder is Chesapeake Bay and the Atlantic Ocean. Image courtesy of Mark Trice. Work and research interests: Tidewater quality and aquatic habitat monitoring and assessment. Work and research highlights: In 2005, a fisherman crabbing on Maryland's Eastern Shore was pinched in the leg by a crab. Shortly after the incident, an infection attributed to the pinch caused the fisherman’s leg to swell to the point where it had to be amputated. But it was too late—a bacteria-borne blood infection already had spread through his body, and the fisherman died. Data from the Moderate Resolution Imaging Spectroradiometer (MODIS) instrument aboard the Terra and Aqua Earth observing satellites helped provide one potential clue behind this mysterious death. The cause was a waterborne bacteria called Vibrio vulnificus, and Mark Trice had the MODIS imagery to show how this lethal microorganism could have found a home in Chesapeake Bay. Trice and his colleagues monitor the health of Chesapeake Bay, focusing on the habitat conditions of key aquatic species such as blue crabs, fish, oysters, and underwater grasses. Along with research vessels, habitat surveys, and approximately 40 near- and real-time continuous water quality monitoring sites throughout the bay, another key data source Trice relies on is imagery derived from data collected by NASA’s constellation of Earth observing satellites. 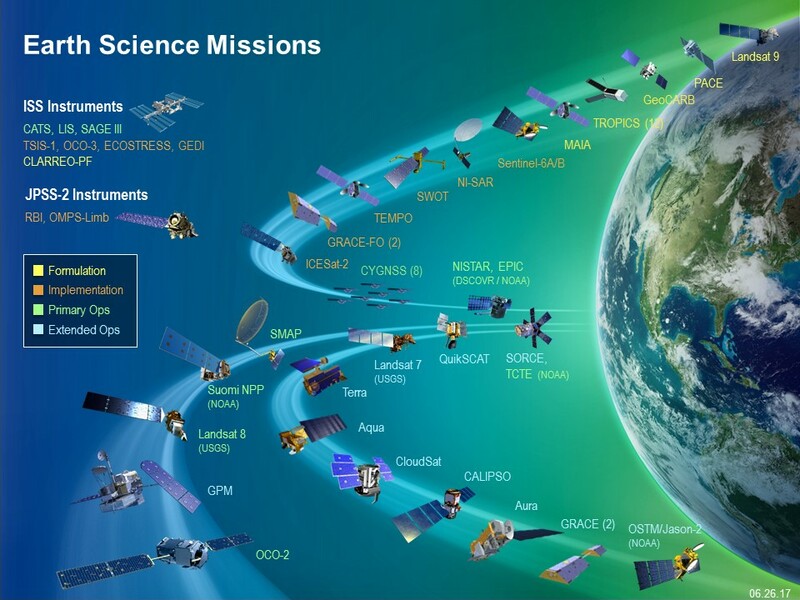 One of Trice’s sources for these data is NASA’s Land, Atmosphere Near real-time Capability for EOS (LANCE) system, which provides near real-time data from orbiting satellites generally within three hours of an observation. 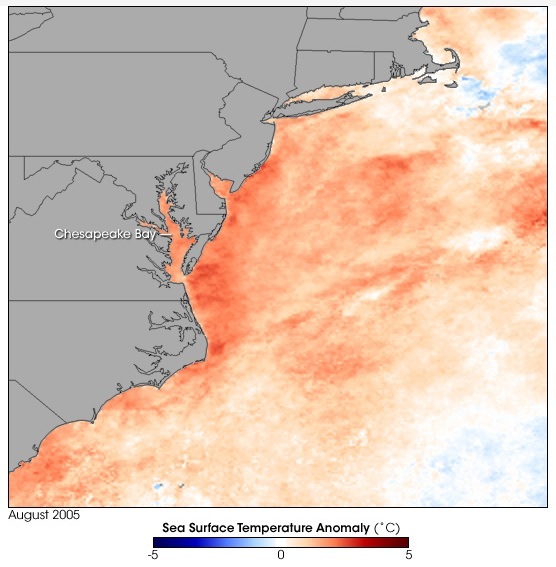 MODIS Sea Surface Temperature Anomaly along the U.S. East Coast for August 2005 showing warmer than normal temperatures (orange/red areas) throughout Chesapeake Bay. NASA image by Jesse Allen, Earth Observatory Team, based on data provided by Ron Vogel, Terrestrial Information Systems Branch, Goddard Space Flight Center. In 2005, the same year as the fisherman’s mysterious death, the Maryland DNR collaborated with NASA and NOAA to document extreme high summer water temperatures in Chesapeake Bay. Unusually warm temperatures can be stressful to fish, reduce oxygen in the water column, and cause die-offs of underwater grasses. MODIS data provided by NASA showed warmer than normal sea surface temperatures all along the East Coast and extending throughout Chesapeake Bay. This warmer water provided a good breeding ground for V. vulnificus bacteria, which are commonly found in the Gulf of Mexico and other warm bodies of salt water. Through a pinch by a crab claw, the bacteria entered the fisherman’s body and caused the infection that killed him. Starting in 2007, the Maryland DNR’s Eyes on the Bay website, which was co-created by Trice in 2003, began posting and archiving daily MODIS imagery along with chlorophyll, surface temperature, turbidity, and suspended matter data provided by NOAA’s CoastWatch program. Eyes on the Bay allows citizens, scientists, and managers to view and access local and bay-wide water quality data and imagery. These data and imagery are critical for assessing the health of an ecosystem that not only supports a wide range of commercial activities, but also is easily susceptible to pollutants. Trice notes that images created from data collected by NASA satellites have been an excellent communication tool for the DNR. The watershed images draw many followers to the Eyes on the Bay website and social media outlets, and expose viewers to other data-driven content they may not otherwise have followed or discovered. Trice and his colleagues also use these images as teaching and communication tools by highlighting features such as seasonal changes in land cover, impervious surfaces in urban areas, sediment plumes, and algal blooms. In some cases, satellite imagery of chlorophyll helped confirm highly ephemeral algal blooms as the cause of fish kills in the bay. In turn, the data collected by the Maryland DNR and their Virginia counterparts help improve the accuracy of the satellite chlorophyll algorithms used to estimate Chesapeake Bay algal conditions by providing hard data collected at the source to validate the remotely-sensed satellite data. Although not yet implemented, Trice and his colleagues hope to use satellite data to assess regulatory criteria for chlorophyll concentrations. These chlorophyll concentrations must meet water quality standards set by the U.S. Environmental Protection Agency (EPA) to maintain the bay as a healthy ecosystem. Along with his work on the Eyes on the Bay website, Trice has been part of numerous research teams looking at productivity in Chesapeake Bay and the effects of pollutants and other impacts on bay species. Estuaries like Chesapeake Bay are very productive ecosystems. However, this productivity has to remain in balance. Excess nutrients such as nitrogen and phosphorus, introduced through septic and sewage waste; agricultural, urban, and lawn fertilizer run-off; sediment erosion; and atmospheric deposition from the burning of fossil fuels, can lead to excess productivity by fueling the growth of algae in the water. When these algae die, they are decomposed by bacteria that consume oxygen and reduce concentrations of oxygen in the water. This reduction in oxygen can impact the growth, reproduction, and even the survival of aquatic organisms and lead to conditions of low dissolved oxygen, or hypoxia. Trice was part of a research team examining the effects of cyclic hypoxic conditions on the progression of an oyster pathogen called Perkinsus marinus, which leads to a disease called “dermo” that is responsible for declines in oyster populations. Levels of dissolved oxygen change throughout the day in a cyclic pattern (called diel-cycling), and reach their lowest levels in the early morning hours due to daily cycles of photosynthesis (which requires light) and respiration. The team explored diel-cycling hypoxia to better understand how these conditions, which are widespread in shallow portions of estuaries like Chesapeake Bay, affect bay organisms. In another study, Trice and his research colleagues studied factors contributing to harmful algal blooms (HABs), which occur when colonies of algae grow out of control while producing toxic or harmful effects on other organisms. The team used fixed monitors to document the hourly to monthly variability in nutrients and the resulting response of phytoplankton to these varying nutrients. The team deployed monitors throughout Chesapeake Bay to measure a range of nutrients, including nitrate+nitrite, ammonium, phosphate, and urea, and the response over time by algae to changes in these nutrients. Work and research findings: In his research into hypoxia, Trice and his colleagues found that human-caused increases in nutrient loads into shallow waters can increase diel-cycling hypoxic conditions and, through this, increase oyster disease problems in shallow waters. The team also found that the diel-cycling of hypoxia increased the acquisition and progression of infections from P. marinus more strongly in younger oysters (1 year old) than in older oysters (2-3 years old). The team hypothesize that the effects of hypoxia on lowering the oyster immune response is the likely mechanism leading to elevated infections in oysters in hypoxic environments. Looking at the larger picture, the team notes that hypoxia, including diel-cycling hypoxia, may impact the success of oyster restoration not only directly (through lower concentrations of dissolved oxygen), but also indirectly (through impacts on the oyster immune system that provide a gateway for disease). While looking at changes in nutrients and the effects of this on algae and HABs, Trice and his colleagues note that fixed monitors constantly collecting data provide a better measure of dynamics than traditional manual sampling. Data collected by the monitors indicate that levels of nutrient concentrations can change rapidly (over a span of hours) through tidal oscillations and algal uptake or more slowly (over several days) in relation to rain events that wash nutrients into the bay. While the data show that increases in nutrients following rainfall events are significant, the time-scale of nutrient response varies. The team found that phosphate and urea show rapid increases with rain events followed by a longer-term sustained increase, while increases in nitrate+nitrite and ammonium lag rainfall events by several days and generally persist for several days. Breitburg, D.L., Hondorp, D., Audemard, C., Carnegie, R.B., Burrell, R.B., Trice, T.M. & Clark, V. (2015). “Landscape-level variation in disease susceptibility related to shallow-water hypoxia.” PLoS ONE, 10(2) [http://doi.org/10.1371/journal.pone.0116223]. Gilbert, P.M., Kelly, V., Alexander, J., Codispoti, L.A., Boicourt, W.C., Trice, T.M. & Michael, B. (2008). “In situ nutrient monitoring: A tool for capturing nutrient variability and the antecedent conditions that support algal blooms.” Harmful Algae, 8(1): 175-181 [http://doi.org/10.1016/j.hal.2008.08.013]. NASA Earth Observatory (2005). “Warm Waters in the Chesapeake.” Published 4 November 2005. http://earthobservatory.nasa.gov/IOTD/view.php?id=5986.